This weeks's challenge at Just Add Ink is to Add Something from Your Stash, preferably something you've not used before! This was my idea and I found it extremely difficult as I was totally overwhelemed with options. No real surprise there though, lol! ﻿It's based on a Make A Card Monday card by Kristina Werner. The frame was so easy to do - I used my Martha Stewart Scoring Board - and it's so effective. The paper is something I've had in my stash for at least 5 years. It's so pretty and shimmery but I had never gotten around to using it. The sentiment is from PTI and has been in my stash for well over 12 months without being used. It's been embossed with White Embossing Powder. I really love how it's turned out and it's a design that I will be able to reproduce for the squillions of birthday cards that I need to make for September, and use some more of that unused DSP that is laying around in my stash. I can't wait to see what you use from your stash for this week's challenge. Love the scored border/frame, Jo. Beautiful card! The frame looks great around the dsp Jo. And great idea for a challenge, I had a lot to choose from too unfortunately. That scored frame is really all the decoration the DSP needs Jo. I like the idea of using DSP scraps - I have plenty of those!! WOW that paper does look so lush and beautiful! I love the simplicity of this one - it works so well! I love the simplicity of this design and can see it as a great way to use up pieces of DSP...great idea that I will have to file away for another time! Love the colours too. 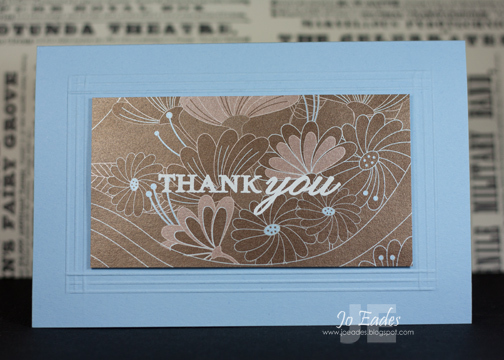 Lovely CAS card Jo, your scored frame looks great and that DSP is such gorgeous colours. A great challenge idea Jo, l really enjoyed this one and it reminded me of some of the cool stuff l have stashed away....l really will use it one day! The scoring on this card is fabulous!